In the hazy realm of childhood memory live two related events: The first time I plopped a scoop of my dad’s orange sherbet into a bowl of vanilla ice cream, and the first time I had an Orange Julius—that icy, OJ + dairy, beverage-stand joy. What a sensation! Bright shock of citrus swathed in cream: cold and shimmery, sharp and smooth, all at once. To me, orange and cream is the stuff of dreams. In fact, the Dominican Republic’s classic orange&dairy drink is called morir sonando “To die dreaming.” March being my birthday month, I decided to put those favorite tart, sweet, and dreamy flavors into a cake. And I am very happy with the result. 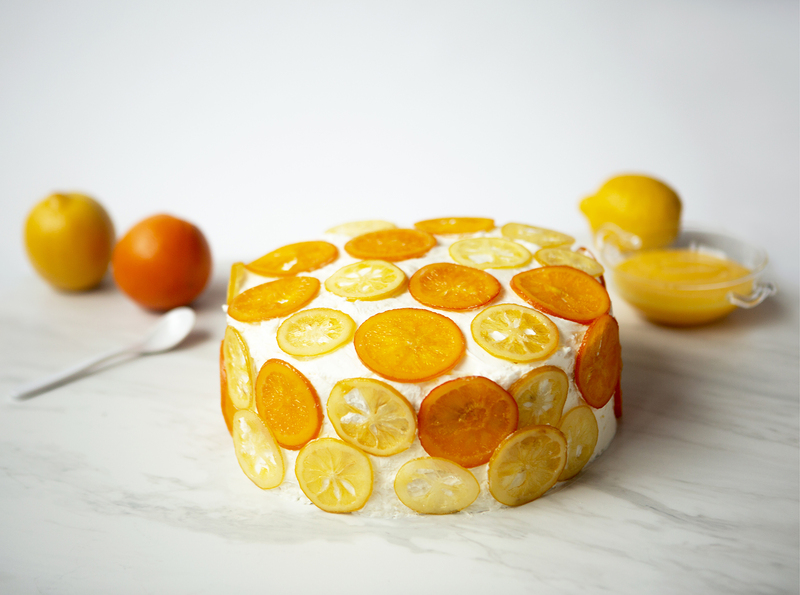 To make it, I layer a tender yellow layer cake with orange curd, pile whipped cream over all, and then garnish with little wheels of candied orange and lemon. Note: You have to let the candied citrus slices dry for a good while in order for them to firm up enough to stand on the cake. I made mine the day before I made the cake. But don’t let that scare you away: If you’re in a hurry? Arrange the still-soft candied citrus flat on the cake, or, substitute orange and lemon jelly candies. The nice thing about this recipe (in addition to the beautiful cake) is that you now have the recipe to make orange curd—great with toast, or scones, or panna cotta. And the candied citrus slices work very well as garnish for other cakes and desserts, too. I plan to do another post featuring these ingredients with pavlova for my gluten-free friends. Also, I have prepared a lemon version of this cake using lemon curd instead orange–that works very nicely, too. Make Candied Citrus Slices: Wash the oranges and lemons. Dry them and place them on a clean cutting board. Using a very sharp knife and extreme caution, slice each piece of fruit as thinly and evenly as possible. (the fresher the fruit; the more easy/clean the slices.) Set slices aside. Fill a large bowl with ice and water in your sink. In a large, broad skillet or saute pan, over medium heat, place 2 cups of water. Heat to a gentle boil. Layer as many of the citrus slices as you can fit in a single layer in the simmering water and simmer for 20 minutes, using tongs to flip each slice at least once. Once the slices begin to look translucent, remove to the ice water bath. Repeat until you have par-cooked all of the fruit slices. Empty the hot water. Place empty skillet back on stove top. Add ½ cup water and 1 cup sugar. Whisk sugar and water together and heat until boiling. Reduce heat to maintain a simmering bubble. Layer as many of the citrus slices as you can fit in a single layer in the simmering sugar water, without crowding or overlapping. Simmer the slices for another 20 minutes to ½ hour until the fruit is shiny and clear-ish and the sugar water has begun to thicken into a syrup. On a cake rack set over paper toweling, remove the candied citrus wheels to dry while you make the orange curd and cake. (Note: If you make the candied citrus the day before, that will give it more time to dry. OR if you have a fruit dehydrator, place the fruit in that to dry.) Repeat the sugar-water simmering step for the rest of the fruit. Heat 3 cups water to slow boil in the bottom of the double boiler, or, in the sauce pan. Before placing over the simmering water, whisk the egg yolks in the top of the double boiler (or if using sauce pan: in the metal bowl. Add the citrus juices, sugar and butter. Place the bowl or double-boiler top over the simmering water. Whisk the ingredients continuously until all of the butter has melted (about five minutes.) Continue whisking until the mixture thickens and coats the back of a spoon. Pour the curd into a non-reactive , heat-proof bowl (glass is great!) Tuck a piece of plastic wrap into the bowl over and in contact with the surface of the curd to prevent a skin from forming. Cool to room temperature. Refrigerate while you make the cake. Make Yellow-Cake Layers: Place rack in the center of the oven. Preheat oven to 350°F. Prepare the two cake pans by greasing, inserting the paper liners and greasing again. In a small bowl, whisk the egg yolks with ¼ cup of the milk, the sour cream and the vanilla. Set aside. In the bowl of a stand mixer with whisk attachment, combine the sugar, flour, baking powder and salt, whisking for three minutes at medium speed. Turn the mixer off to add the butter cubes and remaining cup of milk. Whisk for about two minutes at low speed, and then increase to medium-high speed, scraping the sides of the bowl as needed until you have a smooth batter. Turn mixer off to add the reserved egg yolk mixture in three parts, beating until just incorporated after each addition. Evenly divide the batter between the two cake pans. Firmly tap pans on countertop to release any trapped air bubbles. Bake for 30 to 35 minutes until the cake springs back when lightly touched at the center. 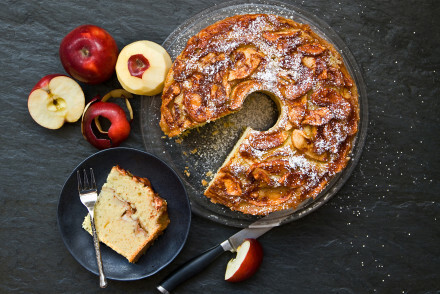 Remove cake layers to a cooling rack for 10 minutes. Turn cake layers out of pans to cool completely. In a small microwaveable bowl, place 2 Tbsp tepid water. Sprinkle the gelatin powder over the water. Stir. Set aside. 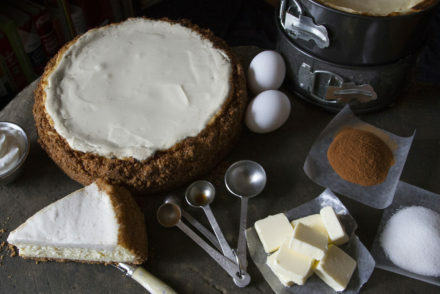 Before you whip the cream, begin to assemble the cake. Trim the “dome” from one layer of the cake. 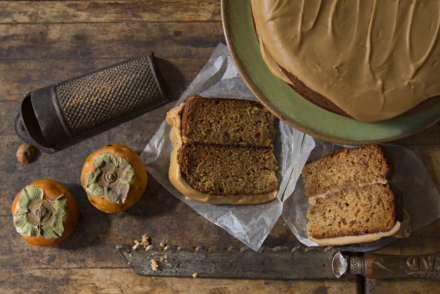 (Eat this now, or save for later : ) Position this bottom layer of the cake on the cake plate. Spread with thick layer of orange curd. Note: you will have some left over. Top with the remaining cake layer. Set aside. In the chilled bowl of a stand mixer with the whisk attachment, add the whipping cream. Whip cream until soft peaks just begin to form. Heat the bloomed gelatin in the microwave for a scant 20 seconds to liquefy. Add the powdered sugar and liquefied gelatin to the cream in the mixer bowl; whisk again until the cream whips to peaks. Do not over whip. Working quickly, slather the top and then the sides of the cake with the whipped cream. Using an offset spatula, smooth the cream on the side of the cake as evenly as possible. Leave the cream on the top of the cake a bit more “peaky” with swirls you can form with a spoon or spatula. 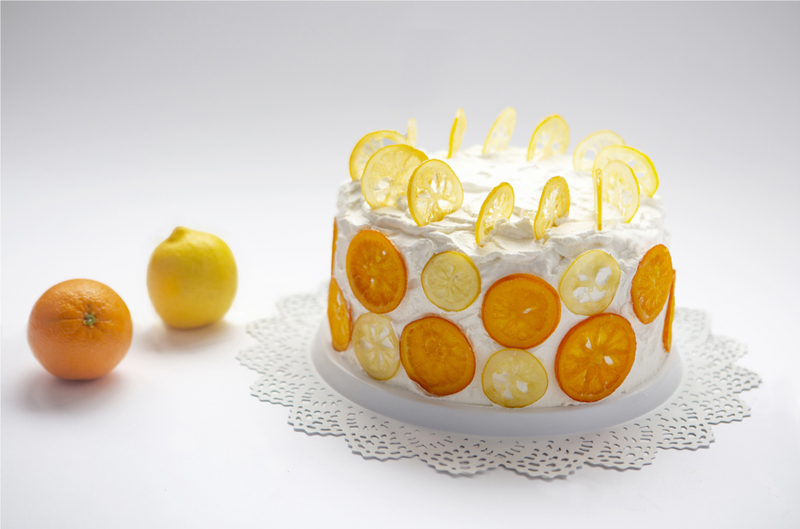 To decorate, arrange the wheels of candied lemon and orange on the top and sides of the cake. Enjoy!